One of the main arguments that the organic critics continue to try to make is that there is no research backing up the recommendations we make. Of course, there is a wealth of research that begins with Dr. T. L. Senn at Clemson University. His studies dealt primarily with seaweed. His information and covered works with seaweed and more is covered in the Research Section of my website. In addition, there are more than 60,000 research papers on mycorrhizal fungi alone. Dr. Michael Amaranthus brought that up on my radio show this past Sunday. 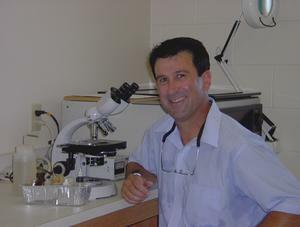 To hear the interview with Dr. Mike on Mycorrhizal Applications click here. Dr. Mike in the lab. 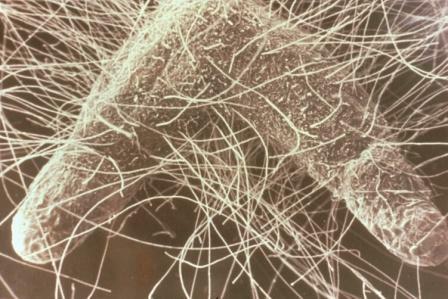 Mycorrhizal covered tips of a pine tree root with mycorrhizal threads attached. 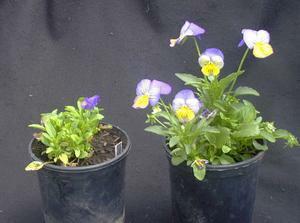 Pansies on the right are treated with mycorrhizal inoculant. MILWAUKEE, WISCONSIN--Exactly how do nutrients such as nitrogen move through the environment? That's a key question in ecology and environmental science. The answer may be clearer thanks to a new technique that uses the light from tiny quantum dots to trace the movement of such nutrients. The technique offers a way for microbial ecologists to watch nutrient flow in real time in the field and forge clearer connections between organisms and the ecological functions they serve. Tracking the movement of nutrients in the real world is difficult. For example, some fungi help transfer nutrients from soil to the roots of plants; to study the process, researchers typically inject a tracer, such as radioactive carbon-14, into the soil and then take a soil sample back to the laboratory, where plant roots are teased out and analyzed to see where the tracer ends up. Root-associated fungi are typically too fine to be seen, so it's been hard to pin down precisely which fungi are responsible for the nutrient transfer and how they work. So microbial ecologists Matthew Whiteside and Kathleen Treseder, both of the University of California, Irvine, set out to find a way to see the nutrient flow in the soil itself. They attached nanometer-sized bits of semiconducting material called quantum dots to organic compounds. As the fungi take in the compounds, they also take in the attached dots, which light up like little light-emitting diodes when zapped with light from an ultraviolet laser. The researchers then imaged that light with a root-level camera. Images trace how the nutrients are consumed by the microscopic fungi and moved into the associated plant. Treseder described the work here this week at the annual meeting of the Ecological Society of America. The researchers have already used the technique to study whether root-associated fungi known as arbuscular mycorrhizae take up organic forms of nitrogen, as in amino acids, and transfer them to plants. The standard view has been that these fungi prefer inorganic forms of nitrogen, such as ammonium. But Whiteside hitched the amino acid glycine to a quantum dot and watched as the fungus absorbed the modified glycine into cell compartments called vacuoles, from which it moved into chloroplasts, the nitrogen-demanding plant structures that carry out photosynthesis. The researchers hope to apply the tool to the larger question of how the biosphere's increasing load of inorganic nitrogen from fertilizers is affecting the balance of carbon and nitrogen in soil and consequently in the atmosphere. 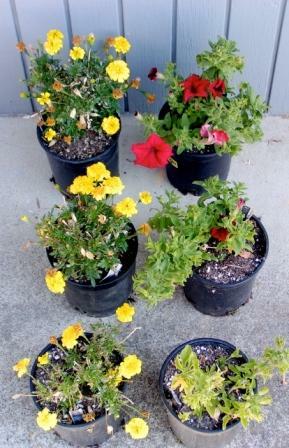 These photos of the marigolds and petunias are a trial.